When deciding what to visit in Cancun, check out the incredible tours from The Adventures Group and enjoy the most exciting excursions Mexico has to offer! Cancun is one of the most beautiful places on earth, which is why it’s no surprise that it’s a popular vacation spot for people of all ages. If you’d like to know what to visit in Cancun so you can create an unforgettable and unique trip, Cancun Adventures has everything you need. With guided tours, catamaran sailing, zip lining, and private beaches, you’ll be able to experience the best parts of Mexico like an expert traveler. Isla Mujeres is an island in the Caribbean, about 8 miles off the coast of Cancun with several beach destinations and miles of coastline to explore. Playa Lancheros and Playa Norte have great dining options nearby and are great for playing in the sand. If you’re looking for something quieter, or for adventure among the ancient ruins, try Punta Sur. You might also enjoy Shark Beach and Garrafon de Castilla. The crystal clear waters of Isla Mujeres are also the perfect place to try snorkeling or scuba diving. Isla Mujeres is also known for its incredible local seafood and exciting nightlife. For a full-day immersive Isla Mujeres experience, try our Luxury Sailing Adventure. Relax on a beautiful catamaran as you sail the shores of Cancun, then stop at Isla Mujeres where you can snorkel in the warm water. You’ll also have time for shopping, relaxing on the beach, and exploring the island. Gourmet lunch and an open bar are included on the luxury catamaran, along with snorkeling gear, lifejackets, and transportation from most hotels. Chichen Itza is one destination you definitely won’t want to miss. It’s one of the new 7 Wonders of the World and an unforgettable collection of archeological sites and cultural history. These Mayan ruins are made up of ancient structures, including the El Castillo pyramid in the center of the site and smaller residential buildings. Be aware that because of preservation efforts El Castillo cannot be climbed. At Chichen Itza, you can also see the Osario Pyramid, the Temple of the Warriors, and the Great Ball Court, an ancient sports arena. Join one of our Chichen Itza tours with our bilingual experts and learn about the history of the Mayans while walking through the ruins. Coba is an ancient Mayan city in the Yucatan Peninsula, about 2 hours from Cancun. Coba once controlled much of the region’s trade routes and is now one of the largest archeological sites in the world. Visitors can see the Nohoch Mul pyramid, the tallest pyramid on the Yucatan Peninsula, and the Pyramid of the Painted Lintel, as well as a collection of religious structures, ball courts, and ancient roads. We offer a Coba Ruins tour that includes transportation to and from Coba, expert tour guides, and lunch. The Tulum area is just south of Cancun and happens to be on the way to Coba. You can easily fit both locations into one day trip by booking a Tulum & Coba Private Tour. Tulum has lots of exciting things to see and do and should definitely be considered when deciding what to visit in Cancun. The Tulum Ruins have been extremely well-preserved, and the 13th-century Mayan city is the only one that overlooks the ocean and is surrounded by a wall. Viewable structures include the Castillo (castle watchtower) perched on a cliff and the Templo de las Pinturas with a partially restored mural. A cenote is a natural pit or sinkhole filled with water, and Tulum has a lot of them in its caves and surrounding areas. The pristine water and beautiful geological formations make the cenotes and expansive network of caves the perfect place to explore and swim, snorkel, or scuba dive. There is also an underground river and a natural lagoon (Yal Ku). Cancun Adventures offers a variety of tours to explore different sites in Tulum, such as the Private Tulum and Underground River Tour, the Tulum Cenote and Yal Ku Snorkeling Adventure, and the Tulum Caves Tour. Sian Ka’an is a large natural reserve in Tulum, just minutes from Cancun. Travel into the heart of the biosphere with a hike and a motorboat ride on the Sian Ka’an Mayan Eco Adventure Tour and discover the beautiful flora and fauna. Keep an eye out for carefully preserved jungle habitats on land and water. The Riviera Maya is a gorgeous stretch of coastline just south of Cancun and full of white sand beaches. Get an amazing view of the coast and the ocean wildlife on a luxurious Riviera Maya Catamaran & Snorkeling Tour. Enjoy swimming, snorkeling, and paddle-boarding, or just relax on the beach and indulge in a light gourmet lunch and drinks on the catamaran. When listing ideas for what to visit in Cancun, you probably didn’t envision rappelling off a cliff and into a portal to the underworld. But with the Cancun Zipline & ATV Outdoor Adventure, you can do just that! Start with a ride in a Polaris ATV on winding trails and rocky paths through the jungle to a mystical Mayan cenote. This natural underground well was believed by the Mayans to be a portal to the underworld. You’ll get to rappel into the cenote, then climb out and walk across it on a tightrope. You can also zip line into the water and swim to the anteroom where the tour continues with snorkeling through stalagmites. Whatever adventure you choose in Cancun, make sure Cancun Adventures is a part of planning your excursions - we promise your trip will be unforgettable! Contact us today for more information, or visit our website to see all the tours available in Cancun and book your next adventure! 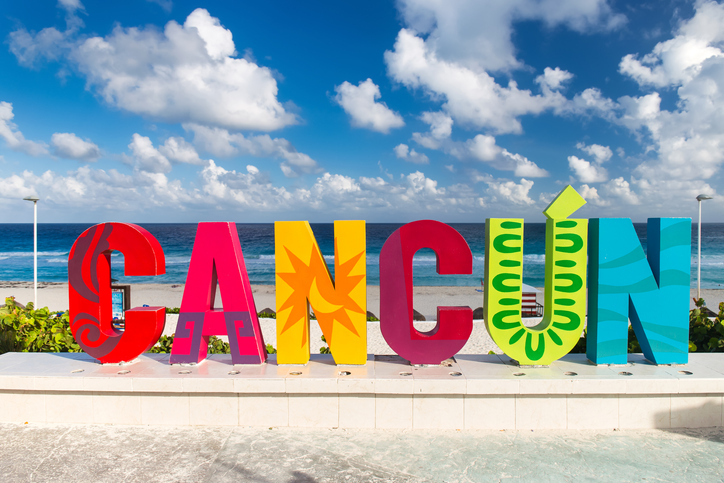 Knowing what to visit in Cancun, you’re sure to have a blast on your next vacation!